The Roman Colosseum is a building that often provokes debate. While we all know what it looks like, what it was used for, and that it’s a huge and amazing structure, most of us do not know much more about it. So the question is, why is the amphitheater regarded as such a masterpiece? 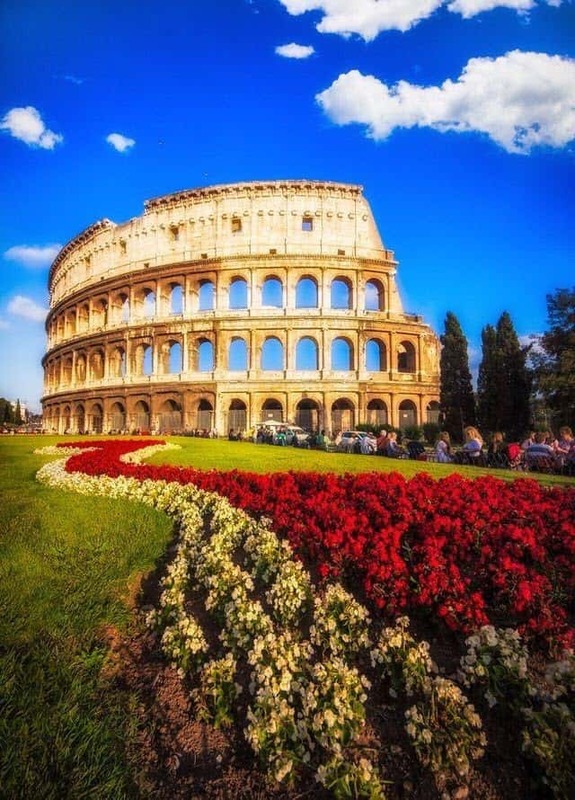 Situated on the eastern side of the Roman Forum, the enormous stone amphitheater known as the Colosseum was built around 70 to 72 AD by Emperor Vespasian of the Flavian dynasty as a gift to the Roman people. In 80 AD, Vespasian’s son Titus officially opened the Colosseum – originally known as the Flavian Amphitheater – with 100 days of games, including gladiatorial battles and wild animal fights. After four centuries of active use, people were unaware of who had actually built the amphitheater and assumed that Vespasian had appointed government employees to work on the project. However, Vespasian’s son Titus had actually brought 60,000 Jewish slaves to Rome who worked day and night to build the Roman Colosseum. 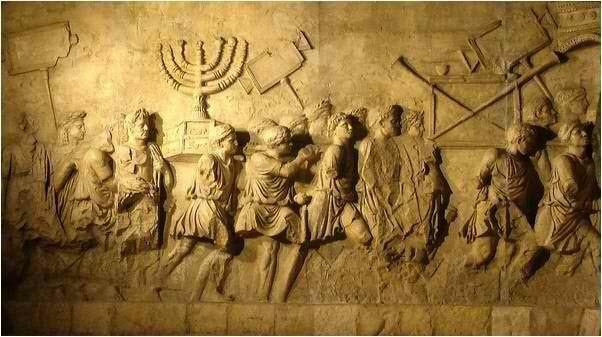 Confirmation of this can be seen in the Arch of Titus, which shows a menorah from Jerusalem. To this day, the Talmud prohibits Jews from walking beneath the arch. As is often the case with ancient monuments, the Colosseum wasn’t born with this name. Construction of the amphitheater began in 72 AD under Emperor Vespasian and his son Titus, a period named after the Flavian dynasty. In this way, the Colosseum was principally known as the Flavian Amphitheater. The name Colosseum was coined in the Middle Ages, and it is believed to allude to the colossal statue of Emperor Nero that stood nearby. 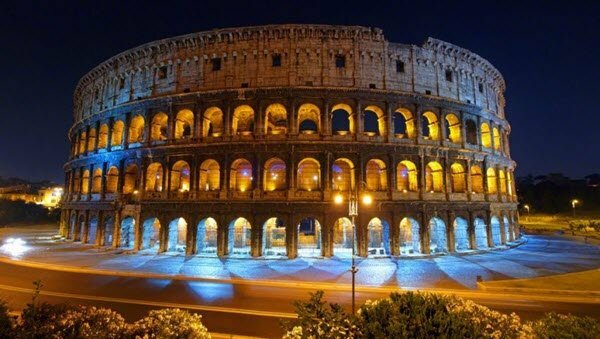 However, legend states that the name Colosseum is connected to Satanic worship, as at the end of every Satanic ritual, the priests would ask: Colis Eum? (Do you worship him? ), which sounds fundamentally the same as the word Colosseum. 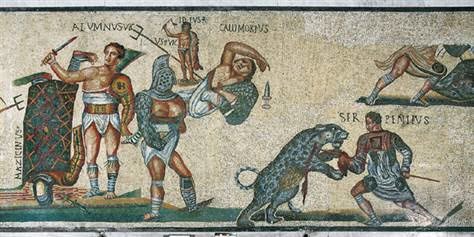 Roman gladiator fights were a means for emperors and the privileged to show off their riches to the masses, to recognize military triumphs, to mark important state visits, to celebrate birthdays, or just as a break from the political and financial issues of the day. The general population loved the excitement of gladiator fights which were held in huge venues throughout the empire, with the Colosseum the grandest of them all. 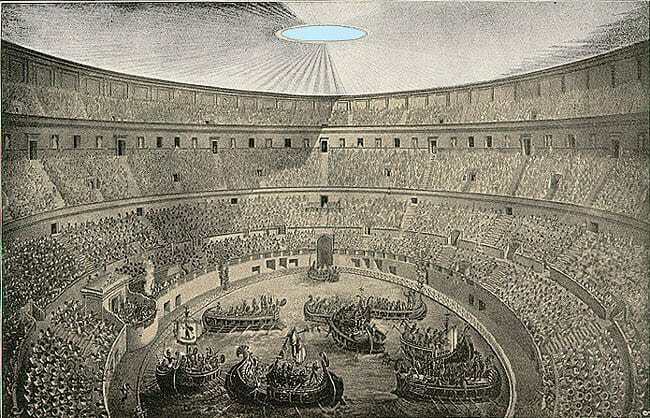 There were often up to 50,000 spectators from all sections of Roman society who enjoyed the games in the Colosseum. Wild and exotic creatures were fought, prisoners were executed, religious zealots were tossed to the lions, fighters employed all their military might in fights to the death, and Roman excellence and strength were celebrated. 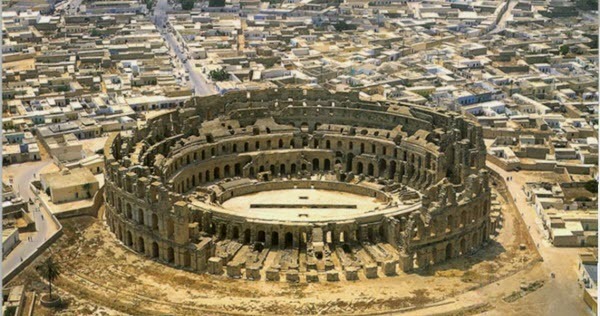 Many blockbuster movies have been inspired by the history of these battles in the amphitheater such as Gladiator which incidentally was not even filmed in Rome, but in sets across different parts of Tunisia. A few historians believe that the building of the Colosseum was subsidized by riches taken from Jerusalem during the quashing of the Great Jewish Revolt in 70 AD. Regardless of this, the enormous undertaking was fully embraced during Emperor Vespasian’s reign, as an “open” point of interest, unlike the self-centered projects of his scorned predecessor, Nero. The Colosseum was built on the site of Nero’s (Domus Aurea) or Golden House which included sweeping gardens and a huge artificial lake. Around 69 AD the site was cleared to make way for the great new structure and other buildings such as the gladiatorial schools. The Colosseum speaks for the ordinary people of Rome rather than to glorify its emperors and their achievements. 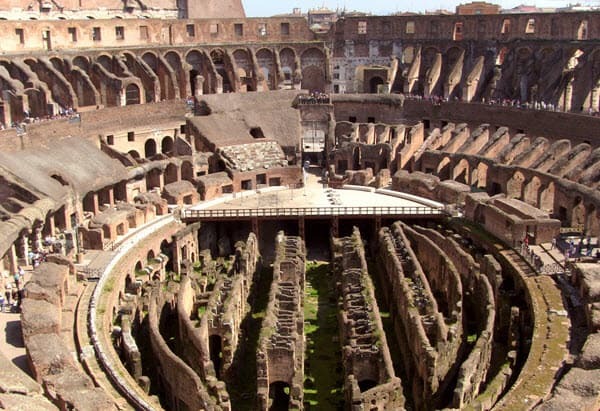 The Colosseum is synonymous with slaughter and death, be it of criminals, professional fighters, or innocent civilians. With this in mind, since the year 2000, the Colosseum has come to represent the opposite. In support of the campaign against the death penalty, every time a sentence of capital punishment is canceled, the Colosseum’s night lighting is changed from white to gold. Another striking and similar case of such powerful action would be in April 2009, when the US state of New Mexico repealed the death penalty. The Romans loved extraordinary and gruesome spectacles, so it is not surprising that the vast majority of shows at the Colosseum included fierce brutality, fights between wild animals and humans, and even executions. 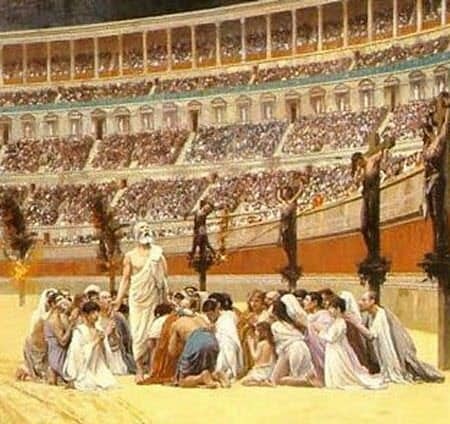 Executions of prisoners and criminals – frequently through torture – were daily occurrences at the Colosseum, and many people died there. The dead bodies were taken out through the west exit, known as the Gate of Death, towards the setting sun. Because of its dark reputation, during the Middle Ages groups of criminals also dumped the bodies of their victims there. It is also believed to be the site of many Pagan rituals because of the abundance of herbs and plants that grew amongst its ruins which attracted those practicing witchcraft. If you ever have the chance to visit the Colosseum, don’t forget to explore its underground passages and cells as well as its beautiful upper levels. Storms, lightning, earthquakes, and fire all contributed to the eventual ruin of the Colosseum. Storms and fire damaged the structure, but it was a tremendous earthquake that finally caused parts of the upper stories and eventually the whole southern wall to fall. Though seriously damaged by two earthquakes in the fifth century, it is thought that the Colosseum remained more or less intact until the sixth century when the devastating earthquakes of 847 and 1231 caused most of the structure to fall. Despite all the damage it has suffered, people still see beauty in the Colosseum and often say that the collapse of the southern side gives it a special atmosphere and is a reminder of its past history and providence. In the 20th century, Roman rulers were influenced by the trend for gardening among the green-fingered English upper classes and started to plant roses and other exotic flowers amongst the ruins, which prospered in the spring waters. As a result, the Colosseum has become a place unlike any other, not only showcasing its birth and decline but charting a history from brutal annihilation to lavish fruitfulness. Today it is open for guided tours and guests can see 1,000 varieties of plants growing within the old walls. It is not entirely clear how many of these species came to be there, but a talk by Edward Salisbury, director of the Royal Botanic Gardens at Kew during the Second World War, may shed some light on this. Discussing the riot of wild blossoms that appeared after the Blitz, he spoke of how the rosebay willow herb could dissipate 80,000 seeds in the time it took to drift 20 meters into the sky, showing the enormous capacity for seeds to spread on the wind. The Colosseum was a setting for other things beyond gladiatorial entertainment, such as public executions and legendary plays. The Romans would frequently re-enact celebrated military triumphs, with free entry and food for visitors. 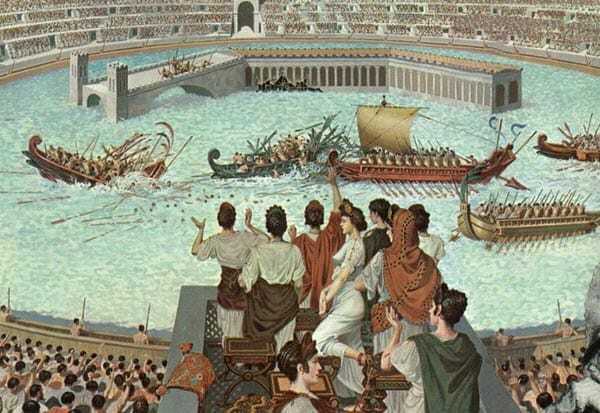 Maybe the most magnificent spectacles at the Colosseum, however, were the sea battles staged in the flooded arena which could be filled and emptied quickly. The greatest sea battle held at the Colosseum was in 80 AD. The Roman ruler Titus demanded that the amphitheater be flooded and ordered flat-bottomed boats to be made which were ideal for the shallow water. Students of history still don’t know precisely how these ocean fights were staged, but the boats used were probably small replicas of genuine Roman boats. The principal battle at the Colosseum involved 3,000 warriors and acted out the fight between Athens and Syracuse. There was even a fake island built in the arena, where the mariners landed and conducted their battles. The last naval battle in the history of the Colosseum was reported to have been staged in 89 AD, and was organized by Emperor Domitian. Roman rulers were considered an integral part of the nation’s religion, and they were routinely worshiped to ensure Roman success both at home and on the battlefield. Since the Romans’ belief in their gods was fundamental in securing the wellbeing of the nation, they were wary of and hostile to other religions such as Christianity and to follow them was considered unpatriotic. Moreover, many Christians refused to serve in the armed forces since killing other people went against their religion. A few Christians also refused to hold government posts, take part in trade, or offer credit since they saw these exercises as morally wrong. The Roman government routinely punished Christians for this, particularly during unsettled periods when there was a tendency to rely on the old Roman beliefs and traditions. They gave Christians the chance to renounce their “bizarre, unpatriotic convictions” before sentencing them to death in the arena or by formal execution. Nowadays, a Christian cross hangs in the Colosseum and is used as a place of worship at certain times of the year to remember those who were killed. This is also linked to the Roman Catholic Church as every Good Friday the Pope leads the torchlit “Way of the Cross” parade which starts at the Colosseum. The Colosseum, originally known as the Flavian Amphitheater, is a magical monument that reflects the history, art, and treasure of the ancient Romans. It documents the suffering, battles and reigns of the past and is considered today to be a key image of imperial Rome. Despite being partially destroyed by earthquakes and other natural disasters, it still is one of Rome’s most popular holiday destinations.